The concept of conservation through hunting big game animals has no merit, Prashant Khetan, Chief Executive Officer and General Counsel at Born Free USA, an animal advocacy organization, recently told CNN. Born Free USA is leading the resistance against trophy hunting. From speaking out against the lifting of the federal ban on importing elephant trophies from two African nations to making the case on the CNN documentary “Trophy,” Born Free USA champions the humane treatment of animals and condemns barbaric practices. Prashant is scheduled to participate in a debate on trophy hunting tonight at 9 p.m. on CNN. “Trophy” will air on the network at 9 p.m. this Sunday. On Thursday, CNN.com posted an article on the issue in advance of the documentary. With more attention being placed on trophy hunting, it is important that Born Free USA speak out with passion and reason. SMITHTOWN, NEW YORK – (November 9, 2015) – One quick Google news search of the term “animal abuse” yields over 53,000 results. Animal abuse is a serious problem that many people are beginning to take notice of due to the horrific news headlines covering the stories. These allegations lately include such heartbreaking stories as animals being slammed, starved, beaten, and more. From undercover investigations taking place at big name food manufacturers to animal cruelty being reported by individuals in communities around the nation, many people are looking for ways to help bring an end to these horrific news stories. Guardians of Rescue (GOR) is an animal rescue organization which has built a reputation for helping to rescue abused and abandoned animals. Being serious about their mission, their investigative team is headed by Joaquin “Jack” Garcia, a former FBI agent, who spent 26 years doing undercover field work on over 100 assignments, including bringing about 39 convictions of Mafia figures. 1. Take notice. The first step is in noticing that it is taking place. Take a look around for signs of animal abuse and cruelty, trusting your instincts when you see something that doesn’t seem right. 2. Report it. Gather as much information as possible about the situation that needs to be reported, and then contact your local agency to make a report. The more information or support you can provide, the more it will help with the investigation and conviction. If you feel the local authorities are not taking action after reporting, then take it to social media. 3. Support organizations. Some people prefer to not get directly involved in the reporting or investigations. They can still help to stop animal abuse by supporting those organizations that investigate abuse and rescue animals. 4. Contact legislatures. Many animal cruelty crimes do not come with severe punishments that would help prevent them from happening in the first place. Contact the powers that be in your state and urge them to make tougher laws for those who are convicted of animal cruelty and abuse. Holding the people accountable is a big step toward preventing more abuse. 5. Pay attention to companies that abuse. Notice the companies that are found to be involved in animal abuse cases. Write or call them to urge them to change their practices and hold their employees accountable for cruelty. When they know consumers care more, they will ensure better treatment of the animals in their care. Another organization working to aid in the rescue of animals is the Eastwood Ranch Foundation, a California-based animal welfare and rescue organization. The founder of the group, Alison Eastwood, actress, film producer, and is the daughter of the beloved actor Clint Eastwood. They routinely rescue animals from high-kill shelters, care for them, and work to find each one a forever home. Guardians of Rescue provides assistance to animals out on the streets, helping to rescue them, provide medical care, food and shelter, and find foster-home placements. Many families are still struggling, such as from Hurricane Sandy, making it difficult for them to care for their pet, either financially or while living in temporary housing. They are also instrumental in helping military members with their pets, and providing therapy dogs to veterans suffering from post traumatic stress disorder. To learn more, get involved, or to make a donation to support the Guardians of Rescue, log onto www.guardiansofrescue.org. About Guardians of Rescue Based in New York, Guardians of Rescue is an organization whose mission is to protect the well being of all animals. They provide aid to animals in distress, including facilitating foster programs, rehabilitation, assisting other rescue groups, and providing support to families, both military and not, who need assistance due to economic factors. To learn more about Guardians of Rescue, visit the site at www.guardiansofrescue.org. The secret ingredient in McDonald’s Chicken McNuggets is brutal animal cruelty. After six short weeks, the surviving birds are grabbed by their legs, wings, and necks and violently slammed into transport crates—often suffering broken bones in the process—and trucked to slaughter. You may remember that last month we exposed unimaginable animal abuse at another Tyson factory farm. As shocking as it is, cruelty and violence run rampant in the poultry industry. There are no federal laws to protect chickens during their lives on factory farms, and most states specifically exclude chickens from anti-cruelty laws. That’s why it is so important for McDonald’s to implement meaningful animal welfare policies and oversight at its supplier farms. As the world’s largest fast-food chain and a top customer to Tyson Foods, McDonald’s has both the power and ethical responsibility to prevent egregious cruelty to millions of animals. Please, take a moment to sign our petition calling on McDonald’s to stop unconscionable animal abuse in its supply chain. Then please share the hidden-camera video with friends and encourage them to take action too. And remember, as individual consumers who care about animals, the most powerful choice we can make is to leave chickens and other animals off our plates. P.S. Help us continue exposing cruelty to animals. Please make a special tax-deductible donation to support our vital undercover investigations aimed at exposing and ending abuse of animals at factory farms. Click here to make a donation. NEW YORK—The ASPCA® (The American Society for the Prevention of Cruelty to Animals®) today commends North Carolina Gov. Pat McCrory for vetoing HB 405, a dangerous ag-gag bill that would have prevented whistleblowers from exposing animal cruelty and food safety issues on factory farms. This bill was so far-reaching that it also threatened to prevent nurses from revealing elder abuse in hospitals or nursing homes, teachers from exposing child abuse at day cares, and workers from documenting workplace discrimination or mistreatment. Despite that strong public opposition and the release of an undercover video that showed shocking cruelty at a North Carolina chicken slaughterhouse, state lawmakers voted in favor of this bill. Recognizing the dangers of a food system without transparency, North Carolina residents quickly appealed to the Governor for a veto alongside a broad coalition of dozens of interest groups and farmers who voiced their opposition to the bill. In addition, newspapers from around the state editorialized against the bill and celebrities including Martha Stewart, Kesha, Nikki Reed, Eric McCormack, Amy Acker, Katherine Schwarzenegger and Andie MacDowell also called for the governor’s veto on social media. For more information about the ASPCA and to join the ASPCA Advocacy Brigade, please visit www.aspca.org. About the ASPCA® Founded in 1866, the ASPCA® (The American Society for the Prevention of Cruelty to Animals®) is the first animal welfare organization in North America and serves as the nation’s leading voice for animals. More than two million supporters strong, the ASPCA’s mission is to provide effective means for the prevention of cruelty to animals throughout the United States. As a 501(c)(3) not-for-profit corporation, the ASPCA is a national leader in the areas of anti-cruelty, community outreach and animal health services. For more information, please visit www.ASPCA.org, and be sure to follow the ASPCA on Facebook, Twitter, and Instagram. NEW YORK—The ASPCA® (The American Society for the Prevention of Cruelty to Animals®) today announced that it has awarded a grant of $10,000 to the National District Attorneys Association (NDAA), which will be used to bolster its National Center for Prosecution of Animal Abuse (NCPAA) program that works to assist and train prosecutors and other professionals on the effective handling of animal abuse cases. The grant funding will help cover the cost of technical assistance, research, strategy discussions with prosecutors, and training requests—including a wide array of webinars. It will also be used to create a training manual for investigators and prosecutors. Thus far in 2013, the ASPCA has awarded nearly $9 million in grant funding to hundreds of organizations across the country. In 2012, the ASPCA gave more than $17 million to 1,039 organizations. To learn more about the ASPCA’s Grants Program, interested animal welfare professionals can visit www.aspcapro.org/Grants. SMITHTOWN, NEW YORK – (February 1, 2013) – Within New York City alone, the ASPCA’s Humane Law Enforcement Department investigates over 5,000 cases of animal cruelty each year; the animals vary from household pets to horses and livestock. However, most cases are never reported and the animal’s suffering goes unrecognized and without the necessary intervention. To assist in the protection of abused animals, the Guardians of Rescue organization steps in. 1. Visible wounds. Abused animals often have visible signs of illness or injury that are not usually being treated. 2. Unhealthy body. Some animals that are not being properly cared for will be emaciated, where their bones are showing, or may be extremely thin. 3. Inadequate grooming. More than just not being brushed, these animals have not been taken care of and are dirty, have overgrown nails, and may have fur that has been extremely matted. 4. Weakness. A sign that animal has been abused may be that they are not able to move around normally or may be limping. 5. Isolated outside. Pets that are left outdoors for a long time are of concern. They may be in unsanitary conditions and not have access to food and water. 6. Unsafe conditions. If a pet is kept in an area that is unsafe and could lead to injury, such as if the area has a lot of broken glass or garbage. 7. Incorrectly crated. While many people crate their pet, it may be abusive if they are using a crate that is too small and does not allow the animal to engage in normal movements, such as standing up. 8. To Report, Make the Call: Those who believe animal abuse may be taking place should contact their local animal shelter or animal control department. Those who are unable to locate the local shelter or humane society, contact the local police at a non-emergency number and get a referral. 9. Be detailed. If there is animal abuse taking place try to get as many details as possible, so that they can be handed over to the authorities. They will need information such as what was happening, times and dates, and the location. 10. Follow-Up: The calls made to report animal abuse are kept anonymous. But they can still be followed up on if they do not hear back from authorities about it in a reasonable time frame. The person turning in the abuse can also choose to testify if they would like to. Recently, the Guardians of Rescue stepped in to respond to a call about two pit bulls being kept in poor conditions. Eleven puppies were found in a dark basement, neglected. The Guardians of Rescue swept in and the mother and puppies were removed for the house, treated for their injuries and sheltered. The Guardians of Rescue is a non-profit organization aimed at assisting animals in distress through providing support and shelter to animals in need. Based in New York, Guardians of Rescue is an organization whose mission is to protect the well being of all animals. They provide aid to animals in distress, including facilitating foster programs, rehabilitation, assisting other rescue groups, and providing support to families, both military and not, who need assistance due to economic factors. To learn more about Guardians of Rescue, visit the site at www.guardiansofrescue.org. New York, NY  In an effort to end domestic violence and keep pets safe, the AKC Humane Fund awarded grants to eleven different pets allowed womens shelters across the country in honor of Octobers National Domestic Violence Awareness Month. The recipient shelters in Safford, Arizona; Cabot, Arkansas; Crescent City and Susanville, California; Fort Collins, Colorado; Alpharetta, Georgia; Aurora, Indiana; Spruce Pine and Whiteville, North Carolina; Spearfish, South Dakota and Spokane, Washington allow women and their pets a safe place to escape domestic violence. Between 25-40% of domestic violence victims are unable to escape abusive situations because they worry about what will happen to their pets or livestock should they leave. Nearly half of battered women with pets report they delayed entering a shelter because of concerns for an animal left behind, according to the University of Denver's Institute for Human-Animal Connection. A recent study found that more than 85 percent of women entering domestic violence shelters talked about pet abuse in their family, and as many as 71 percent of battered women say their pets have been killed, harmed, or threatened by their abusers. According to Purdue Universitys Center for the Human-Animal Bond, contact with animals decreases blood pressure, reduces anxiety, and provides a general sense of well-being. The AKC Humane Fundsm, founded by the American Kennel Club® in 2008, was created to unite a broad spectrum of animal lovers in promoting the joy and value of responsible pet ownership through education, outreach and grant-making. Through its programs, the AKC Humane Funds goals are to: support Parent Club Rescue activities; assist shelters for domestic abuse victims that permit pets; provide resources for responsible dog ownership education; contribute to non-profit organizations that support its mission. Contributions to the AKC Humane Fund are fully tax deductible as allowed by law under Section 501(c)(3) of the IRS Code. The American Kennel Club(AKC) proudly celebrated its 125th Anniversary in 2009. Since 1884 the not-for-profit organization has maintained the largest registry of purebred dogs in the world, and today its rules govern more than 20,000 canine competitions each year. The AKC is dedicated to upholding the integrity of its registry, promoting the sport of purebred dogs and breeding for type and function. Along with its nearly 5,000 licensed and member clubs and its affiliated organizations, the AKC advocates for the purebred dog as a family companion, advances canine health and well-being, works to protect the rights of all dog owners and promotes responsible dog ownership. Affiliate AKC organizations include the AKC Humane Fund, AKC Canine Health Foundation, AKC Companion Animal Recovery and the AKC Museum of the Dog. For more information, visit www.akc.org. NEW YORK—The ASPCA® (American Society for the Prevention of Cruelty to Animals®) and the National Link Coalition today launched the first-ever toolkit to help communities build coalitions to address the link between animal cruelty and human violence. The resource was developed by Dr. Randall Lockwood, senior vice president of ASPCA Forensic Sciences and Anti-Cruelty Projects, and Phil Arkow, coordinator for the National Link Coalition. The Toolkit for Starting a Link Coalition in Your Community is a 34-page, illustrated manual that outlines how communities can form coalitions by connecting officials in child welfare, animal welfare, domestic violence response and adult protective services to identify and respond to incidents of animal abuse and interpersonal violence. The toolkit is available free of charge to the public and includes details on how to start a coalition, along with case studies to encourage communities to take action and urge stakeholders to collaborate and work toward a multidisciplinary approach in addressing animal cruelty and human violence. Experts recognize that various forms of family and community violence are interrelated, and that law enforcement, social services and animal welfare professionals often deal with the same offenders and victims. In a past study, the ASPCA found that a majority of law enforcement officers surveyed—78 percent—believe that animal abusers are more likely to be involved in interpersonal violence or other violent crimes. * Other sources report that 70 percent of animal abusers had criminal records including crimes of violence, property, drugs, or disorderly behavior. Additionally, numerous studies have documented that battered women delay leaving abusive situations out of fear for the safety of their animals, and that up to 71 percent of battered women said their partners harmed, killed or threatened pets. There are nearly 30 coalitions that currently exist in the U.S. including: San Bernardino County Animal Cruelty Task Force (San Bernardino, Calif.); Colorado Alliance for Cruelty Prevention (Denver, Colo.); Safety Network for Abused Animals and People (Washington, D.C.); The Linkage Project (Portland, Maine); Human/Animal Violence Education Network (Berkshire County, Mass. ); and Ohio Domestic Violence Network (Columbus, Ohio). For additional information about the Toolkit for Starting a Link Coalition in Your Community, and to view a list of existing coalitions that the public can get involved in, please visit www.nationallinkcoalition.org or http://www.aspcapro.org/the-link-between-animal-cruelty-and-huma.php. *Figure taken from a 2010 ASPCA study, entitled “Public and Professional Perspectives on Animal Cruelty,” conducted by Southeastern Institute of Research, Inc. The research highlighted the critical role that animal services and animal cruelty investigations play in communities nationwide while pointing out the obstacles that law enforcement face in responding to animal abuse. The National Link Coalition is a collaborative network of individuals and organizations in human services and animal welfare who address the intersections between animal abuse, domestic violence, child maltreatment, and elder abuse through research, public policy, programming and community awareness. The coalition believes that human and animal well-being, and the agencies dealing with these issues are linked and that the prevention of family and community violence can best be achieved through partnerships representing multi-species perspectives. The coalition serves as a resource for state, regional and local groups seeking to form regional Link coalitions in their communities. Its vision is that humans and animals will be measurably safer through the recognition and integration of The Link into policies and practices nationwide. For more information visit www.nationallinkcoalition.org and follow the NLC on Facebook. 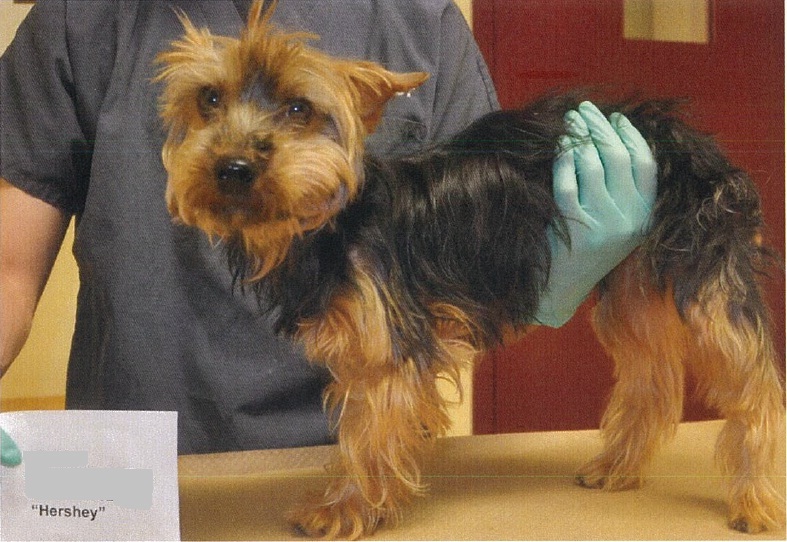 NEW YORK—Humane Law Enforcement (HLE) agents of the ASPCA® (The American Society for the Prevention of Cruelty to Animals®) today arrested Queens resident Grimilda Amil of Ridgewood for allegedly neglecting and starving her 3-year-old male Yorkshire terrier, named Hershey. On June 27, 2012, ASPCA HLE agents responded to the ASPCA’s Mobile Spay/Neuter Clinic on Metropolitan Avenue in Queens, after staff became concerned about the condition of a dog that had been taken to the Clinic by its owner, Ms. Amil. Amil relinquished ownership of Hershey to the ASPCA, and he was transported by the agents to the ASPCA’s Bergh Memorial Animal Hospital for evaluation and treatment. 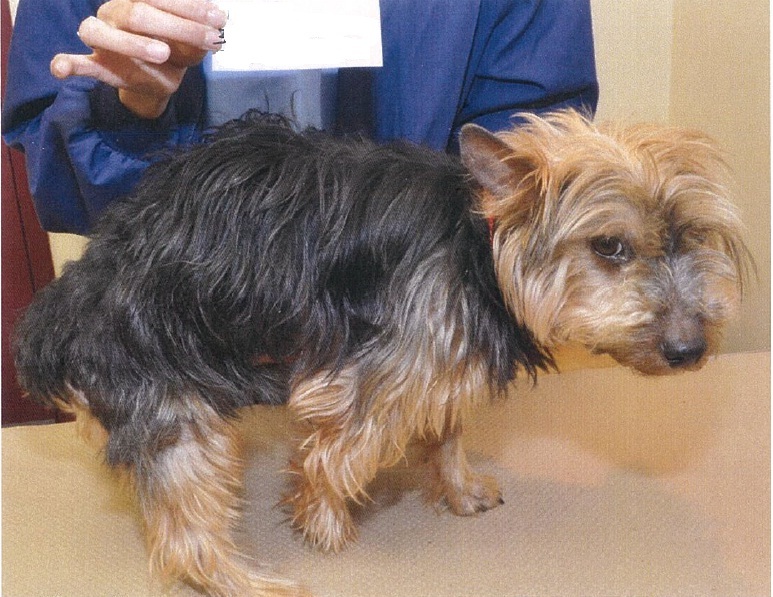 ASPCA veterinarians found Hershey to be emaciated, anemic and to have pressure sores, and determined that he had been starved. Upon intake, Hershey weighed 5.2 pounds; after receiving treatment by ASPCA staff, he now weighs 10.1 pounds—a 94 percent increase. Hershey is recovering at the home of a foster family and will eventually be made available for adoption. Amil, 55, was arrested by ASPCA Special Agent Joann Sandano. She was charged with one count of misdemeanor animal cruelty. If convicted, she faces up to one year in jail and/or a $1,000 fine. Amil is due in Queens Criminal Court on October 4.